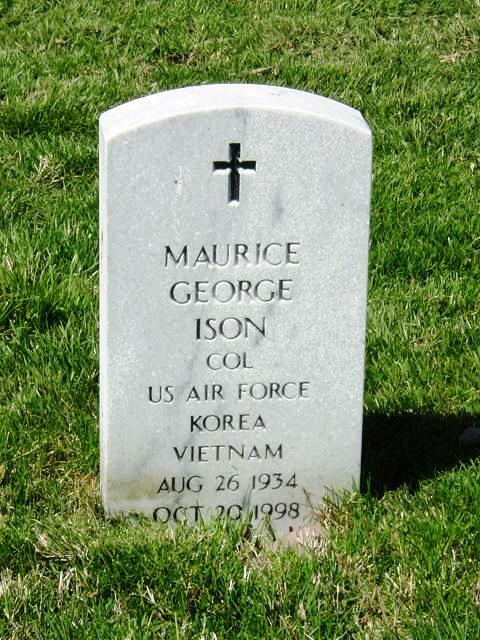 Maurice George Ison, 64, a retired Colonel who had a 25-year career with the Air Force, first as a commissioned officer and then as a civilian employee, died of cancer October 20, 1998 at his home in Alexandria, Virginia. A native of Leicester, England, he immigrated to this country in the early 1950s and shortly thereafter enlisted in the Air Force. Rising from the enlisted ranks to master sergeant, he received a commission as a captain, then left the Air Force in 1958 to work as a civilian military for the Wisconsin Air National Guard. Returning to active duty in the Air Force in 1976, he had a series of senior-level positions while assigned to the National Guard Bureau, the Pentagon and Andrews Air Force Base. His last assignment before his military retirement in 1976 was senior air national guard representative to the assistant secretary of defense for reserve affairs. He reentered the civil service in 1989, working six years for the Air Force until his retirement in 1995 as special assistant to the assistant secretary of the Air Force. Survivors include his wife, Maureen G. Ison of Alexandria; four children, Scott Ison, Justin Ison, Dawn Cornelius and Andrea Tern'e, all of Alexandria; two brothers; and three sisters. On Tuesday, October 20, 1998, at his residence in Alexandria, VA, beloved husband of Maureen G. Ison; loving father of Dawn Cornelius, Scott Ison, Andrea Terne and Justin Ison; brother of Herbert Ison, Melba Coltman, Brenda Blankley, Derek Ison and Heather Jeffrey. Also survived by three grandchildren.